"Threw this together for my family for Thanksgiving breakfast and it was a hit. The boys asked if it was pumpkin pie! If desired, you can add chocolate chips after pancakes are poured onto the skillet, pat them with a bit of batter so they don't stick when turned." Used brown sugar and chocolate chips, as someone else recommended. Yum! 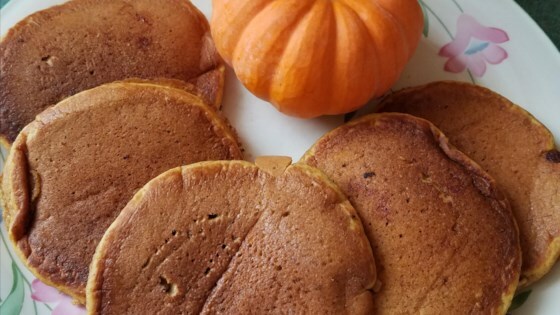 Our new fav pancake recipe...and healthier too with the pumpkin and lack of oil in the batter. Everyone loved it! Thank you for sharing such an awesome recipe. Delicious but batter a bit heavy. I added a hand full of golden raisins and a sprinkle of toasted, sliced almonds on one side of each cake.